Finally, you've been cleared to undertake the covert strike that you've spent your whole life preparing for. The mission? Infiltrating an awesome Halloween party. It can be your friend's or a complete stranger's... we trust you to make that decision. And the exact details of that mission, i.e. why we're sending you in, well... you'll find that out when you get there. Right now, your job is to just focus on the invasion, and for that you'll need the proper headgear: the Adult Green Tactical Helmet! This awesome piece has the realism and details that make it a dead ringer for the helmets used by U.S. combat troops and SWAT teams on the most important missions. That includes adjustable straps, so you won't have to worry about losing your cover when the fictional bullets start flying. 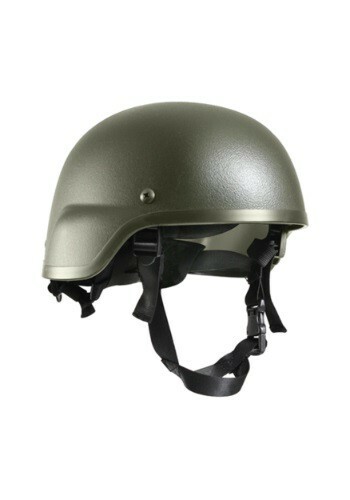 The Adult Green Tactical Helmet makes the perfect finishing touch to any Army costume -- so check out or wide selection of military-themed items!